Easily transition from a resilient floor to flush flooring with a durable floor reducer strip. 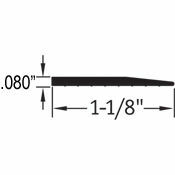 This easy-to-clean and durable vinyl transition strip is for creating a gentle grade between .080" flooring material to 0" flush floor. Johnsonite's vinyl transition strip provides safe surfaces for both pedestrian and wheeled traffic, while protecting floor threshold and subfloor edging. 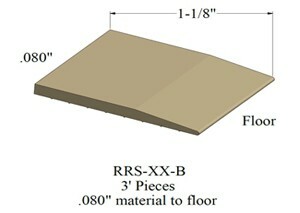 This Johnsonite floor reducer is available in Johnsonite's standard 27 Colors. See the Transition Installation Video for help during the installation process.